Adelheid Chirco at Ocean Independence tells me that the 38.5m motor yacht Onyx is being loaded today for a journey to South East Easia where she'll be available for charter from the beginning of December. She was built by Sanlorenzo in 2009 as one of the highly innovative series of aluminium superyachts called the Alloy 40 range. A notable, radical feature is four folding platforms that create exclusive lateral terraces on the main deck: two in the living area and two in the owner's cabin, lowering large bulkheads on the sides and bringing the outside into the superyacht. Her Paszkowski interior accommodates 10 guests in a main deck master, VIP, double and two twins and she was built to ABS class and MCA compliant. Charter rates on Onyx start from €120,000 per week. 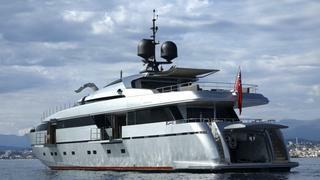 Onyx is listed for sale on boatinternational.com by Ocean Independence asking €13.5 million.